An increasing number of competitors are contending for your client base. The key to becoming more customer-centric and maintaining customer loyalty is information! Gaining insight into what your customers are seeking will allow you to react quickly to customers requests and anticipate future needs. With Avanti CRM (Customer Relationship Management), our mission is to combine technology and business strategy to give your organization a full consistent view of your customers in a way that continually builds and strengthens the relationship. Our software easily manages critical sales, marketing, and customer information. Every customer interaction is an opportunity to grow your business. Even when it’s a complaint. Tracking each interaction keeps your finger on the pulse of each account, and gives you insight into all aspects of your relationship. Activity Tracking provides you with the knowledge required to grow, foster, and improve the relationship you and your staff have with your customers. Avanti CRM guarantees that your customer’s needs are met rapidly by ensuring your sales team and customer service professionals have real-time access to an up-to-date view of all customer, prospect and suspect information. Avanti offers instant access to current contact information, estimates and quotes, job information, historical and current invoices, customer sales, and profit history. 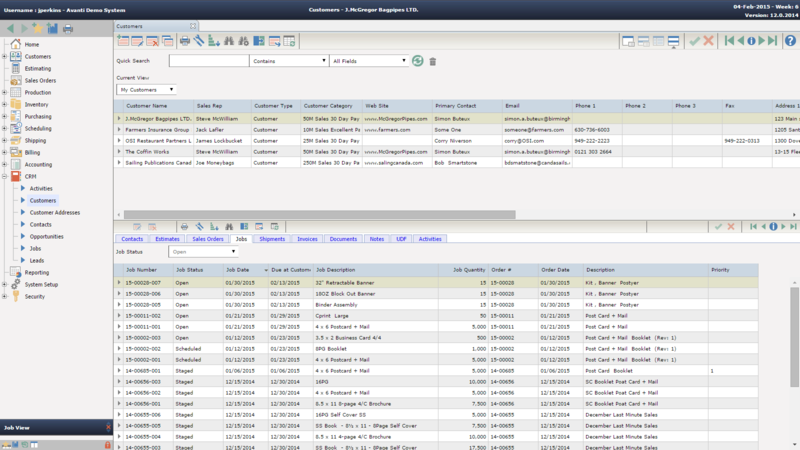 Store, view, and search specific customer data using user defined fields. 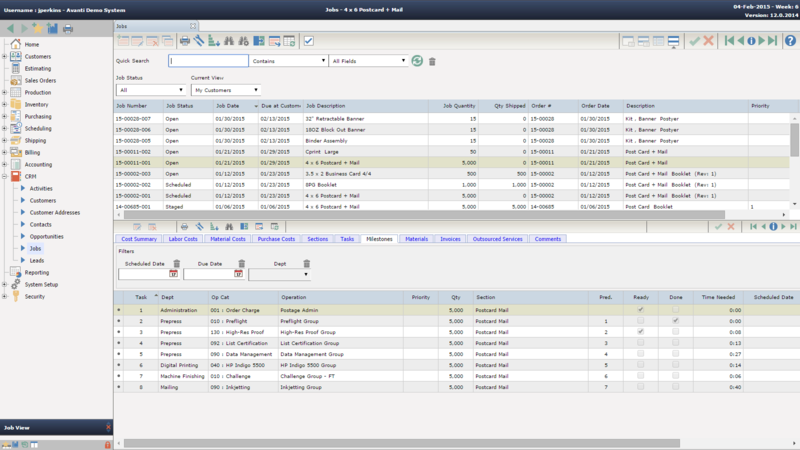 View notes by Job, by Contact, by Estimate, or by Customer. Ensure the appropriate resolution of all open issues; managers can customize automated alerts, redirecting follow-up with the proper personnel. Every business has its own unique “language”, regardless of the industry. For the print industry, this becomes even more apparent when you consider the fact that terms used in offset can be different from digital, or sheetfed vs roll-fed, In-plant vs Commercial, etc. With Avanti Slingshot’s UDFs, you have the flexibility to customize fields to suit your business, without the need to pigeon-hole yourself into someone else’s lingo. Help your company plan the activities that will most effectively increase revenue and profitability. Avanti CRM will properly organize and analyze information to maximize your profit. Produce automatic forecast reports which are built from current estimating information. Maintain snapshots of the forecast and expected revenue data for comparative and historical trend analysis to ensure forecast accuracy. Monitor expected close dates, % chance of close, competition and win/loss trends. 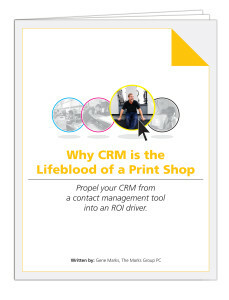 Learn the 3 success criteria for successful CRM systems in the printing industry.